Rain has definitely put a stop to any photography today, but hey its a Bank Holiday weekend so what do you expect…guess it means more time playing with the iPad! This was taken yesterday evening in my village, I did two versions one as a normal colour and one with the infrared camera, I binned the colour even after turning in to black and white as soon as I worked on the infrared image you see here. I also took this shot with and without the Lee Filters Big Stopper, without the filter the image lacked something it was a bit boring, but with it in place the movement in the sky and leaves did the trick. ~ by David Baker on 29 May, 2010. 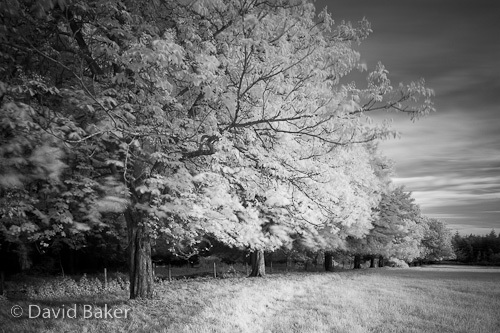 Stunning as usual Mr Baker…Infrared is great for the summer months, means you don’t need to get up early !